You can download the folders / documents to the Library from the selected account. 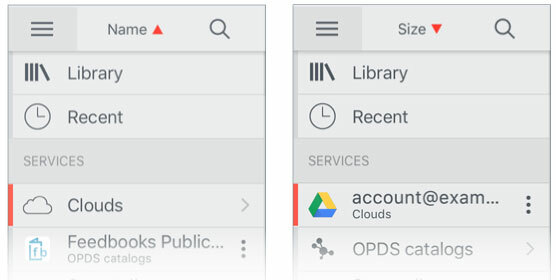 Tap Main menu on the Toolbar to go to the Clouds service. Hold on a folder / document in normal (default) mode to show the Info Panel. Tap on the Info Panel. In the popup window select the destination folder of the Library. Tap Edit on the Toolbar to display the Edit Bar and enter to Edit mode. Select the folders / documents in the Account, and then tap on the Edit Bar. In the popup window select the destination folder of the Library. You can upload the selected folders / documents of the Library to your account. Tap Main menu on the Toolbar to go to the Library. Hold on a folder / document in normal (default) mode to show the Info Panel. Tap on the Info Panel. In the popup window select Export to Storage. In the popup window select an account, and then, the folder in the account. Tap Edit on the Toolbar to display the Edit Bar and enter to Edit mode. Select the folders / documents in the Library, and then tap on the Edit Bar. In the popup window select Export to Storage. In the popup window select an account, and then, the folder in the account. Tap on the Toolbar to choose Transfer List. 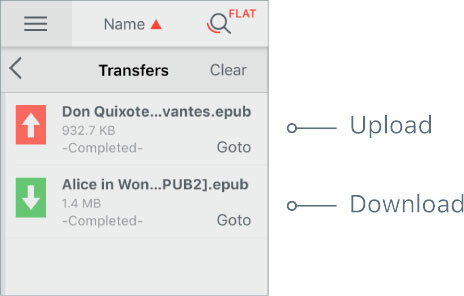 After the download / upload is complete, tap Goto to go to the selected file in the Library / Cloud.